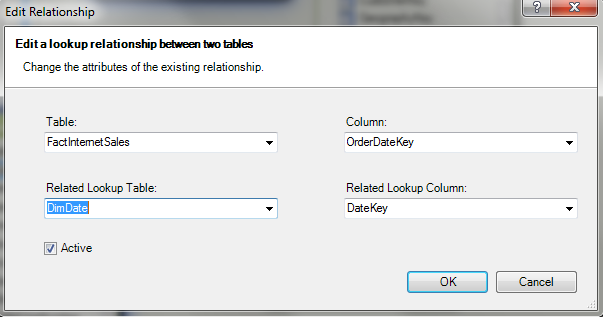 In the SQL server Denali release it will be possible to work with multiple relationships between two tables. This blog post will show you how to use this in DAX to create a measure that uses the inactive relationship. As you can see the FactInternetsales table has three different dates’s that are related to one sale transaction: an Order date, a Due date and a Ship date. You also notice that we have three lines between the FactInternetsales table and the Dimdate table, and one of them looks different. The relationship with the solid line represents the active relationship. An active relationship means that by default Excel and DAX will use this relationship to when traveling the relationship. 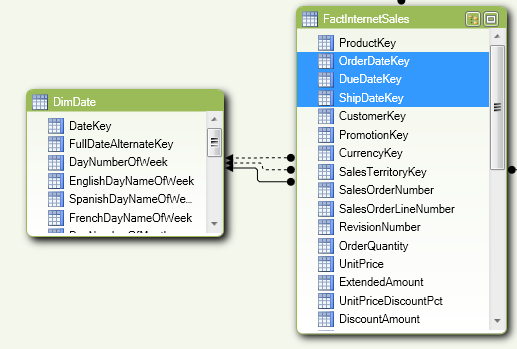 If you were to drag in a column of the DimDate table on rows and a measure from the FactInternsales table into the values area of the Pivottable it would automaticly use the OrderDateKey relationship. Only one relationship can be active at any time between two tables. This is a great solution for a lot of practical cases. Very useful. This is great stuff. Thanks for sharing Kasper! This is very helpful. Thanks for posting. – the data table with 4 fields: UnitCode1, UnitCode2, Projectrelated (yes/No) and Value. I want a column with the Unit name, which is dependant on whether an entry is Project related or not. I linked the column UnitCode1 in the data table to the General unit code. However, If an entry in the data table is Projectrelated, UnitCode2 should be used to determine the unit. If I use RELATED, Powerpivot will allways use UnitCode1. I cannot use USERELATIONSHIP either because it requires CALCULATE or a similar function. Any suggestions? Many thanks! Jeroen.